In Tibet, sweet mac and yak cheese makes a hearty dessert. Many Tibetan Buddhists eat meat, and lots of it. But during the holy month of Saka Dawa, which occurs in the fourth month of the Tibetan calendar (often beginning in May and ending in June), followers honor Buddha’s birth, enlightenment, teachings, and death by resisting carnivorous inclinations. Rather than eat ascetically, Tibetans make the most of vegetarian dishes. 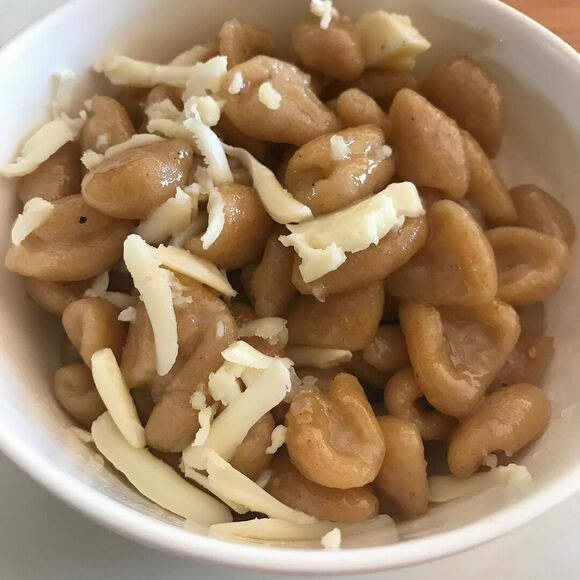 Bhatsa marku, a sweet, rich dessert reminiscent of mac ‘n’ cheese, becomes particularly beloved at this time of year. Diners top off the heavy mixture of butter, sugar, and noodles with milky dri (female yak) cheese, which tends not to melt or become stringy, even atop steaming noodles. Like mac ‘n’ cheese in many Western countries, bhatsa marku has a reputation as being a comfort food in Tibet. But really, what dish—in or outside the country—could be more comforting than buttery, cheesy noodles sweetened into tasting like dessert? This traditional eatery serves "bhakeha marku" made from handmade pasta, sugar, butter, and grated cheese. Monks make this stunning, ephemeral art from yak butter and mineral pigments. This sugar-soaked South Asian sweet isn’t your basic bread pudding.